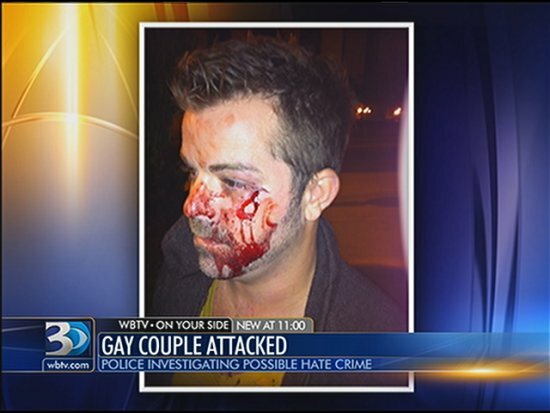 Gruesome result of anti-gay hate crime in Asheville, NC [WBTV-News image]. Asheville, North Carolina – A gay couple was harassed, cursed, and then brutally attacked because of their sexual orientation on September 23, but the repercussions are still being felt in this nominally gay-friendly city. The Citizen-Times reports that Charlotte gay men Mark Little and Dustin Martin had anti-gay slurs shouted at them by two women driving a slow-moving car in the early morning hours of a quiet Sunday morning as they walked along Otis street. Martin “had enough” of the epithets, and shouted back at the women to stop. Little said that at that moment, a black male rushed out of the vehicle and attacked Martin, punching him several times in the chest. When Little intervened, the assailant turned on him, beating him to the ground and gashing his face. “I screamed for him to stop, and he hit me in the face on the left side, and blood went everywhere. I was lying on the concrete,” Little told the Citizen-Times. Though three weeks have passed since the homophobic assault, both men say they remain “shaken” and fearful when any car pulls up beside them. The Asheville Police say very little about the case, since it is still under investigation. Even though there is abundant testimony that the attack was bias-motivated and therefore a hate crime, since North Carolina does not have a gay hate crime provision in the state code, the incident can only be classified as a simple assault. The police do not have suspects in the case, only descriptions of the assailant and the four-door sedan in which he sped from the scene. According to WBTV-News in Charlotte, Little and his partner Martin are frustrated that the Asheville Police are not taking the attack seriously enough. “I feel like that when the cop first came on the scene he just felt like it was just an ordinary crime,” Little said. “But what had happened is we were hit just because we were gay.” As On Top Magazine observes, this bashing incident occurred only a few months after the notorious anti-gay Amendment One was passed overwhelmingly by the voters of the Old North State. The irony of this hate crime is all the more severe since Martin and Little love Asheville, one of North Carolina’s most gay-accepting cities, and have made weekend getaways there regularly from their home in Charlotte. Now, apparently, no city or town in the state is free of the new tide of right wing, anti-gay hate expressed in Amendment One. I am sorry to hear that this happened. However, I object to the idea that gay men being bashed should have a special category such as “hate crime.” Let them get over themselves. They have to realize that they are still a minority, even in these gay-crazy times, and if they want to prance around in public and shove their sickness in everyone’s faces then they deserve what they get. I am a mother of two kids, and if my kid told me he was a homosexual I would disown him, with love and best wishes. You are one of many mothers who could still learn that difference does not constitute grounds for rejection. Your notion of being gay as a “sickness” is antiquated, and just plain wrong. Anti-gay bias is the real sickness, and I hope you will think better of yourself than to let it go unaddressed. You are bound to have many good qualities as a human being and a mother. This opinion of yours is not informed, loving, or indicative of a person willing to learn and grow. I could not disagree with you more, yet I wish you well. Wow. Glad you’re not my mother. Gay isn’t a choice. It’s what you ARE. To disown your child for something he can’t help shows an incredible lack of sensitivity on your part. Just like women who wear shorts deserve to be raped, right? Also, Reesa, they in no way where “shoving in their faces”. They where just living their lives and where yelled at by women in a car, with no provocation. You may not agree with gay-bashing, but your attitude is part of the problem. Come to the twenty-first century please, you need to be here. A mother (or any “family” member) who would disown their child (or any other family member) for anything other than being harmed in some way by them isn’t fit to be a viable human being, much less a parent. Monsters like this person should just be made of vomit and bile since that’s what they produce and all they offer to life and the world. Good god.! Your not a mother—you’re just a fucker!